Particle & Surface Sciences are proud to announce the new distributorship of a product range from Surface Measurement Systems, UK. Surface Measurement Systems develops and engineers innovative experimental techniques and instrumentation for physico-chemical characterisation of solid state materials. The company are leaders in Dynamic Vapor Sorption technology and Inverse Gas Chromatography instrumentation. The Inverse Gas Chromatography - Surface Energy Analyzer (iGC-SEA) is specially designed to determine the surface energy heterogeneity but nevertheless suitable for measuring different surface and bulk properties of solid materials including acid / base properties, heat of sorption, glass transition temperature, solubility parameters and so on. Surface Measurement Systems other product, the Dynamic Vapor Sorption (DVS) allows for real-time monitoring and controlling of vapor and gas concentration for sorption measurements in solid state materials. The sorption mechanism may be investigated from sorption / desorption isotherms and hysteresis effects. The combination of a video microscope and vibrational spectroscopic techniques with DVS would allow for increased understanding of vapor-induced structural changes of solid materials. 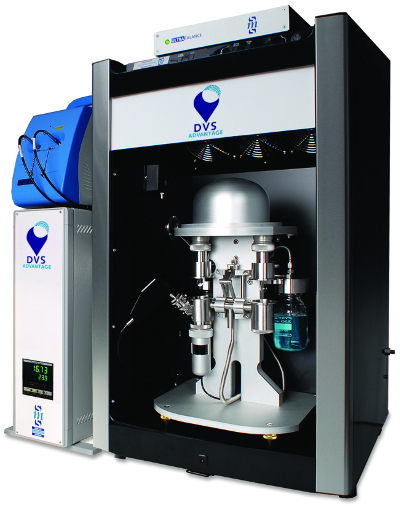 The DVS Vacuum can offer measurements on vapour pressure and heat of evaporation of solids, low pressure vapour/gas sorption and vacuum drying. The Vapor Pressure Analyzer (VPA) measures the vapor pressures of solids, liquids and oils using the Knudsen effusion method. For more information regarding the new Surface Measurement Systems product range or technical advice regarding your particular application, please contact PsS. "Committed to Service Since 1991"
Particle and Surface Sciences shall strive to provide excellence in the Sales, Service and Technical Support of the specialist Scientific Instruments to specialist Scientific Markets.